Tiffany Lasserrre is the only founding member who is also a full-time employee of the cooperative. She has been involved in Médor since its very beginning and she is now its head of communication and publication. As such, she is an ideal person to talk to us about the creation of this magazine, which is unique in its kind in the French-speaking part of Belgium. Indeed, whilst the majority of Médor’s members are its readers and the arrangements for the involvement of the self-employed workers (the journalists) would appear to be of a hybrid nature or even foreign to the typologies of cooperatives represented by CICOPA, their experience resonates strongly with the cooperative model as a tool at the service of the needs of the journalists and an independent press. In fact, the Médor cooperative was only formally established in 2014: “we spent two years just thinking about the idea and as the group of founders continued to grow, we finally decided that the cooperative form was the best fit for both our project and our values. We then gave ourselves one year to launch the publication. We did not want to throw ourselves into the project without being sure that people would read our publication! 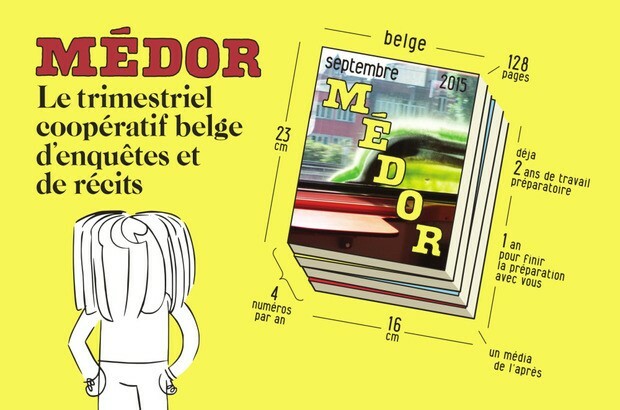 So, we spent a year looking for our future readers across Belgium. We organised close to 100 meetings to talk about the project and to ask people in it to pay their 60 EUR subscription in advance. It was a kind of crowdfunding. If the project had not got off the ground, we would have given everyone their money back. Our aim was to have 3,800 subscribers before publishing the first issue, but we quickly realised that this was completely out of the question”, Tiffany explains with a wide grin. When the journalists met in 2012 to talk about what was making them feel dissatisfied, they highlighted three main issues: money, time and freedom of expression.